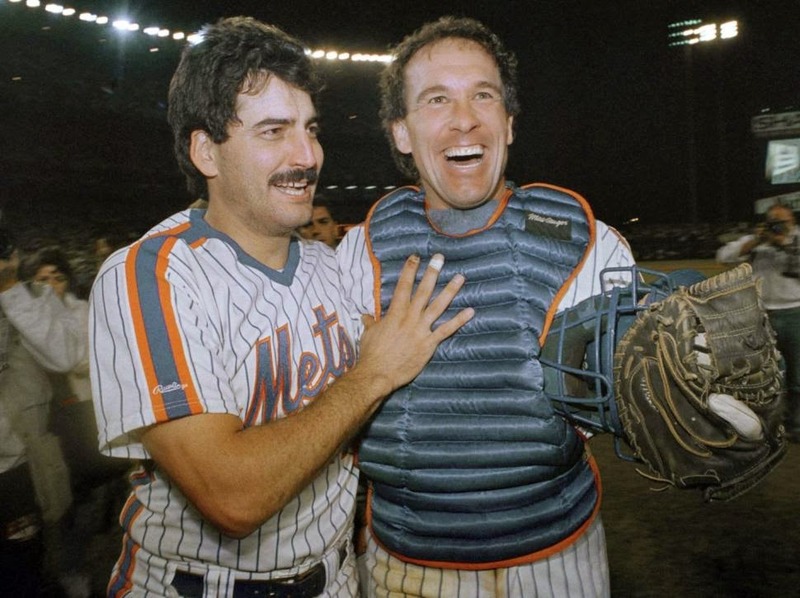 Thursday September 22, 1988: Davey Johnson's Mets (94-57) were on a roll counting down toward winning the 1988 NL Eastern title. They come on strong down the stretch, to overtake the Pittsburgh Pirates. The win onthis evening, was their eighth in a row, 13 out of their last 14 and 18 out of their last 22. 45,274 came out to Shea Stadium, to see the Mets clinch their second NL Eastern Title in three years. The Shea Faithful, cheered loudly from the first pitch onward through the night. NYPD had 80 mounted policeman on horses & over 800 Police officers in total were on hand to make sure no one got onto the field. Shea was not about to repeat the 1986 clinching celebration, where the fans stormed the & ripped up the field. The public address announcer welcomed their presence in the 8th inning as the crowd greeted them with boos. The fans of course wanted to repeat with an '86 type like celebration. Ron Darling (15-9) got the start tonight and became the fourth Mets pitcher to celebrate on the mound as the Mets won an Eastern title. Darling found a little extra in his arm that night and was going to finish the game no matter what. Darling went the distance allowing only one run, on six hits, with one walk and struck out four. It was his 16th win of the year, he would end up third on the '88 team with 17 wins and third with a 3.25 ERA. The Mets only scored three runs off Philadelphia's Don Carman, but it was all they needed. Mookie Wilson led with three hits on the night & a run scored. In the home 5th, down 1-0, Kevin Elster led off with a double. Mookie followed with a one out single, Elster going to third. Greg Jeffries then grounded out to third, scoring Kevin Elster tying the game 1-1. In the 6th inning, Daryl Strawberry sigled & reached third on a Kevin McReynolds single. Straw then scored when Don Carman thre a wild pitch. In the 7th, Mookie singled & advanced to second & then scored when Kevin McReynolds had an infield single himself. In the 9th inning, Darling struck out Von Hayes, then got Juan Samuel to ground out to the mound. Darling then struck out Lance Parrish to end the game. 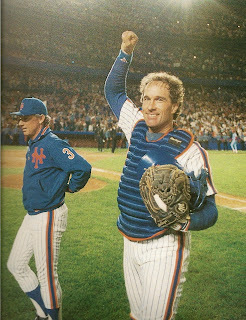 Darling was met on the mound by catcher Gary Carter in celebration. The rest of the team joined them with no pressure from the fans, as the mounted police stopped anyone from storming the field. The Mets celebration moved on to the clubhouse. 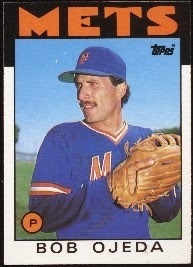 Trivia: The night before, the Mets recieved bad news when pitcher; Bobby Ojeda injured himself at home trimming his hedges. Ojeda had severed his left index finger and had to under go nearly five hours of surgery to repair it. He was lost for the rest of the year & more importantly, the post season. His absence was certainly missed as the Mets lost the NLCS to the Los Angeles Dodgers. Although with Dwight Gooden, Ron Darling & David Cone the Mets were still looking good in the pitching department heading to the playoffs.